Ms. Sandra Gutierrez, who is one of the new teachers at Blair this year, used to be an ESOL student. 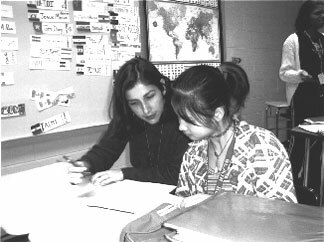 Now she is an ESOL teacher. Ms. Gutierrez was 15 years old when she came to the United States. She was born and raised in Lima, Peru. It was very, very difficult for me to understand anything. I felt like I was a mute person, she said. I felt frustrated because I was thinking so many things about what was going to happen tomorrow. They had four dictionaries in her home to help her with English and that helped her with her homework. Her sister was one person she could talk with who could help her, too. When she was in school in one class they had 40 students, but the teachers were very caring. Every day they would have a new student coming into the class. But she was one of the few Latinas in the class. The worst part of the day was lunch because I didn't know who to sit with, she said. And some of the classes were boring, she added. But she still has memories of how difficult it was for her. There was a time when I wanted to drop out of school because it was so hard, she said. After she graduated from college, Ms. Gutierrez worked in an office in D.C. but she changed to become a teacher. One reason was she always thought she could help kids and becoming a teacher was the first step. She wanted to be an ESOL teacher because she was an ESOL student herself and she knew how ESOL students felt.